Sometimes while copy data to USB pen drive or Memory card, windows shows a surprising error. The error says, “The Dis is Write-protected. 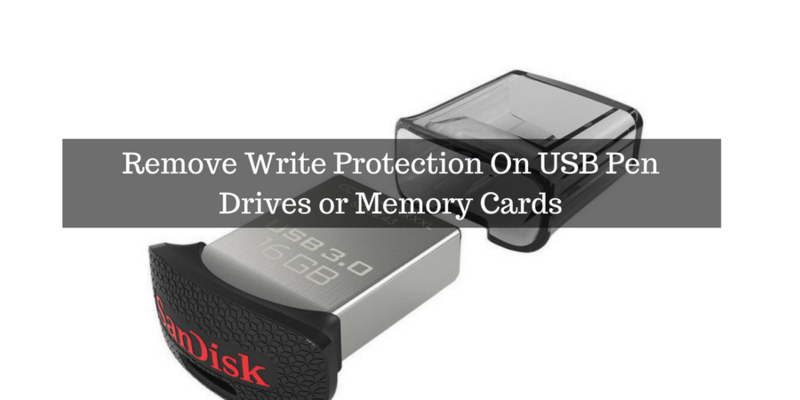 Remove write-protection or use another disk.” In this case, you can not copy files to pen drive or memory card. This situation can be very frustrating because formatting pen drive also cannot help. You can only see files inside it. I received many emails and messages on the Facebook page for the solution of this problem. In this post, I am adding few solutions to solve this problem and repair your pen drive. First of all, check for the physical lock in pen drive. Few companies sell pen drives with a physical lock. This physical locks can make pen drive write protected. If The lock is not there, you can follow these steps. Solution 1: There is a nice tool called repair that can help you in repairing your USB stick or memory card. Download this tool from the link. Download plug in the card or pen drive in your system and then run the tool. It will ask you to format the Pen drive. Format the pen drive with this tool. Next time when you try to copy data to your pen drive or card, it will easily copy data to the pen drive without any problem. Solution 2: Sometimes, the problem may be in your computer’s registry. So, you need to edit the registry to fix the problem. 1. Open Start Menu, type regedit in the search box and press Enter, this will open the registry editor. Select it and see at the right side. It has a key WriteProtect, edit it and change its value to 0. Restart your computer and check again. I am sure any of these 2 fixes will surely solve your problem. If you are still facing the problem, comment below. I will soon respond with more fixes.